Its Vision Vancouver members who select the candidates. 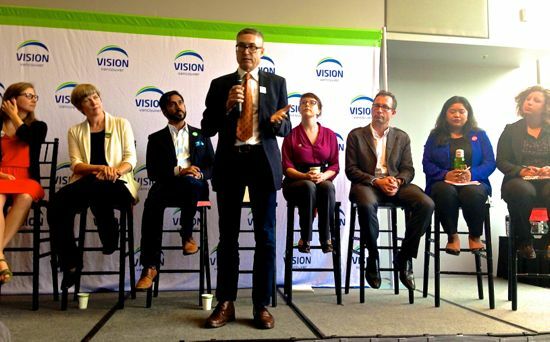 It was a fun and exciting debate last night for Vision Vancouver candidates for the Park Board and the members who attended. Thanks to all the other candidates for participating in the process. Loads of talent for the members to just pick four candidates. Nomination races are a great form of democratic process for political parties where the members are the ones who are empowered to choose the candidates. Of course I hope I will be one of the four. Here are my reasons why. I want to be on the Park Board because I am passionate about the idea of making great public space for people, habitat, urban wildlife and our pets. Whether from making our community centres more inclusive and welcoming to our parks where we connect with nature, these spaces are important in making social connections. These are places where we make friends, chat about with neighbours and discuss issues. These social interactions are what make us happy and healthy. I want to participate in the process of stewarding and creating great and diverse public spaces where we can share our lives and that is why I want to be on the Park Board. Tonight I am asking your vote to support me. I know from the experience of raising my kids the importance of our parks and community centres. These are the spaces that we meet our friends and entry points to participate in our communities. They’ve allowed me to actively participate in civic life from community gardens, art projects, community celebrations and active transportation advocacy. These relationships and dialogues are critical to building a more inclusive, welcoming, vital and sustainable Vancouver. I understand these issues both from personal experience and from my extensive history of activism in Vancouver. That is why I am asking for your support to nominate me as a Vision Vancouver Park Board candidate. Categorized under: me, Vancouver Park Board, Vanpoli, Vision Vancouver.